Pair of 1950s Directoire Inspiration Sconces by Maison Lunel. 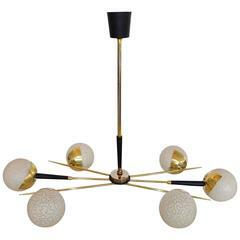 Circular brass chandelier, consisting of a circular brass base, on which are arranged six brass sconces. Each arm has a black lacquered metal plate supporting an oval lampshade. A brass rod interposed by a brass fluted gun barrel patina connects the chandelier to the ceiling. 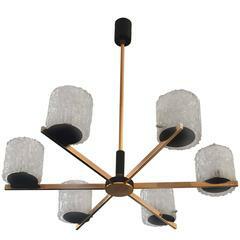 A knob of conical shape brass with a gun barrel patina is set under the base of the chandelier. This chandelier has been completely restored. Wired to the EU standards. Lampshade redone according to the original. 1950s French work by Maison Lunel. Perfect condition. This chandelier will be partially disassembled for transport. Superb two patina brass and gun metal Maison Lunel five arms chandelier. US rewired and in working condition. 40 watt max bulb per light. Chandelier by Maison Lunel. Six opaline glass globes. Can also be used as wall light. 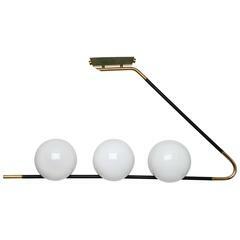 A wonderful original 1950s Lunel French sleek pendant with straight lined polished brass arms with black enamel holders and heavy thick hand blown textured glass shades. Rewired. Pair of 1950s sconces by Maison Lunel in gilded brass decorated by a blackened brass plate. 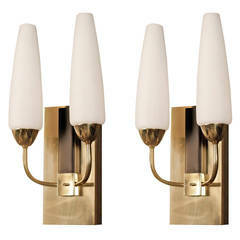 Two opalin lighted arms per sconce. 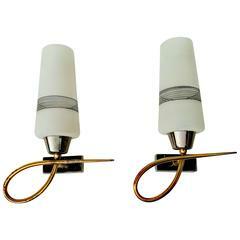 Lovely pair of 1950s Maison Lunel sconces made of brass with glass shades. These sconces compliment both traditional and modern interior spaces.